Maybe Emergency Cash could be more automatic; actually grow legs, arms, and be able to perform itself completely cutting you out of the picture all together! But luckily it still needs you to say a few words, or a few more words. Call 911! Up the mojo to near explosive levels with powerful comedy opportunities, mixed mystery with other people’s money! Everyone knows better than to trust a magician, but they loan you a bill anyway. A small pay envelope is your collateral. The spectator signs, folds, and paper clips the bill assuring the use of NO DUPLICATES. The envelope is waved over the bill and the bill vanishes! Open the envelope and you will find a nest of FIVE total envelopes! 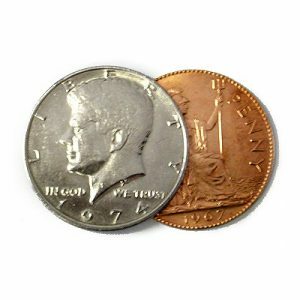 The smallest inner envelope is opened by the spectator and inside is their signed bill! Simple reset means instant magic! Diabolical method a million-dollar secret! No palming, pocket work, or fake appendages! 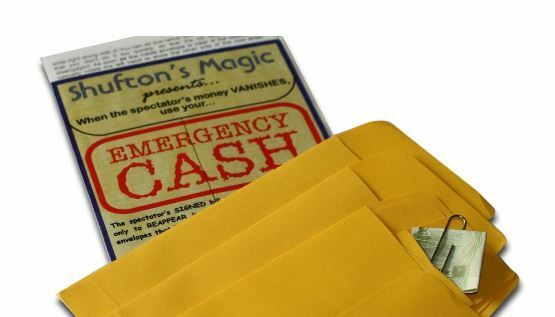 Emergency Cash is a daily miracle pulling you center stage! Shufton knows you like to perform every time someone asks to see a trick. Here’s a comfortable solution to a great problem! 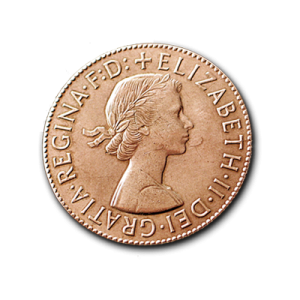 Emergency Cash is a self-contained device, featuring intimate architecture and efficient durable construction! There’s no way! 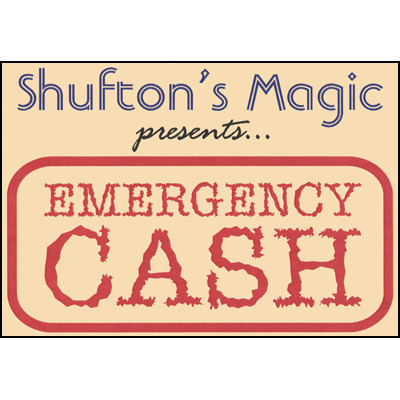 Except this way, Emergency Cash by Steve Shufton is a model of efficiency you can perform completely surrounded! New automatic transfer technology gives you the power to control the bill at all times, without any sort of conventional slide! Steve Shufton makes Emergency Cash an evolutionary turning point for magic’s most intriguing plot, a borrowed object to impossible location. The routine and device work together weaving strict conditions and open handling. Get your Emergency Cash today, while supplies last!